We examine the sensitivity of the process (Formula presented) to extra gauge bosons, (Formula presented) and (Formula presented) which arise in various extensions of the standard model. 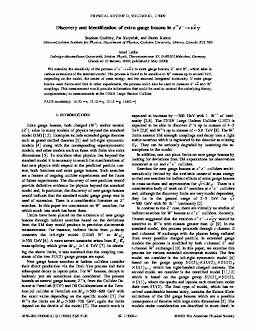 The process is found to be sensitive to (Formula presented) masses up to several TeV, depending on the model, the center of mass energy, and the assumed integrated luminosity. If extra gauge bosons were discovered first in other experiments, the process could also be used to measure (Formula presented) and (Formula presented) couplings. This measurement would provide information that could be used to unravel the underlying theory, complementary to measurements at the CERN Large Hadron Collider.